An avid Windows fanboy might see bringing Apple elements to their desktop as a form of contamination, and similarly, those especially partial to Cupertino produce have been known to reject any remnant of Microsoft’s OS. But not everybody thinks this way, and having seen (and used) some great OS X themes for Windows in the past, a new, iOS 7-based skin for Windows 8 and Windows 7 has just caught my eye. It looks fantastic, and as well as taking many design cues from Apple’s latest mobile software release, also borrows from OS X for a truly unique desktop experience. I use Windows and OS X (and even Google’s Chrome OS) on a daily basis, and while there’s a lot I love about Windows, I do rather admire the overall appearance of the Mac UI. 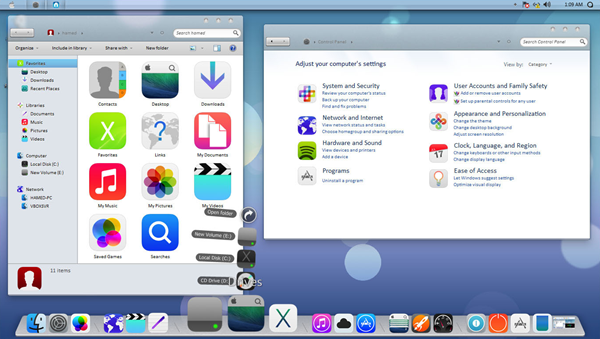 The iOS 7 theme for Windows 8 (and 7) is intended to emulate the look of Apple’s mobile operating system, but because of the nature of Windows being a desktop-like environment (despite the recent touch-based support), it arguably appears more similar to OS X. Not that this is a bad thing though. The folks behind this skin seem to have found a nice balance between the two, and considering how Apple is also in the process of amalgamating its two key ecosystems, the crossover doesn’t come as much of a surprise. Akin to the latest version of iOS, icons within this theme are clean and flat, and considering this is the first time we’ve seen the iOS 7 look plastered on a desktop, we’d say that the look works for the most part. You also get iOS 6 / OS X-like folders, and the dock along the bottom is once again a Mac feature iOS 7-ified thanks to the crisp, ironed-out icons. Installing this particular skin is easy thanks to the online installer, which takes you through every step to ensure the new look is achieved without so much as a hitch. 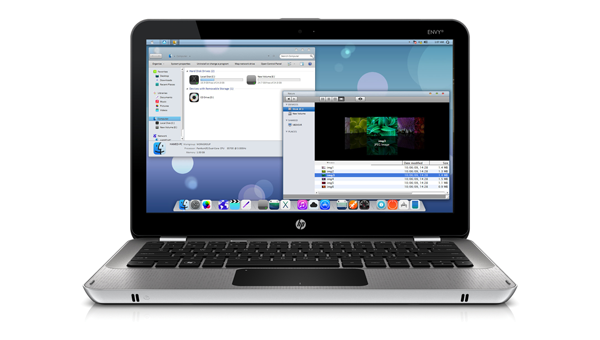 Not only is it compatible with the latest Windows 8.1, but also Windows 8 and Windows 7. So, if you’ve been on the hunt for a decent, Apple-like look on your Windows device, be sure to give this one a try. It is free, after all, and since it’s pretty thorough, you won’t need to be scratching around for additional theming elements after installation. You can download the iOS 7 skin pack for Windows 7 from here and Windows 8 from here. For more wallpapers and themes, visit our Windows Wallpapers and Windows Themes Gallery.